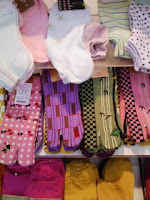 There are Japanese taste socks like this picture. Why don't you buying these socks as souvenirs to your friends?? I bet you can find the store selling socks ealily. YATSUHASHI is one of the best known sweets of Kyoto. It's made from rice flour , sugar and cinnamon. There are 2 type of Yatsuhashi. one is Baked Yatsuhashi and another one is raw Yatsuhashi. BakedYATSUHASHI is like cinnamon cookie. Raw YATSUHASHI (Nama yatsuhashi) has a soft texture and is often eaten wrapped around red bean paste and may come in a variety of different flavours. my favorite flavour is sesame paste raw yatsuhashi. But I saw chocolate banana flavour and chocolate strawberry flavour at the shop so I wanna try them ! when you stay with us. you can try Yatsuhashi in your room. we serve it with tea. If you like it you can buy them for souvenir from Kyoto. Yatuhashi is most popular souvenir from Kyoto! I am always wondering why he is there... I pass through him almost everyday when I go to work. I am not surprised anymore but some people (They are probably visitors I guess...) whisper staring at him. He is in front of the variety store in the Teramachi arcade which is not far from our hotel. He is always stiring something with a long stick. This is my question, Who is he????? This is the guy I am talking about!!! He sells Turkish Icecream in Kyoto. He has a big pot filled up with ice cream. I have never tried it but I am very curious about him, not about Turkish Ice cream. I heard that Turkish Ice cream is sticky and has to be stired. Anyway, I have seen only a few people who bought it even though I have ever passed through him many times. How can he maitain his small ice cream store? Is he a real Turkish? Where is he from? Why does he sell Turkish Ice cream in such a normal arcade? What is his ambition? I have a lot of questions but I don't have courage to speak to him. So, this is still mystery. Please someone talk to him and tell me the answers!! Turkish ice cream is 300 yen. If you are a student, you can get student discount! Thank you for reading our hotel blog. We are now under construction to repair outside of the wall. We try not to bother your stay as much as possible we can. They are new our hotel staff Only for 5days. They are Junior high school students come to our hotel for job experience from their school. They can not choose where they want to work and with who . teacher send them to the working place. most popular place for job experience is for boys fire station and for girls are nursery school. They went back to school today. We hope they could enjoy working with us !